This sequel to Love Fortunes and Other Disasters is just as quirky, hilarious, and magical as the first book, delivering a heartfelt message about love and choosing your own destiny. Aspiring love charm maker Hijiri Kitamura was excited to come back to Grimbaud for her sophomore year - until she learns about the upcoming charm-making competition. She, along with her friends and fellow rebels, had worked too hard to free the town from Zita’s tyrannical love fortunes to allow some other charm maker to move in and take over. The only solution is for Hijiri to win the contest herself. Unfortunately, that's easier said than done, especially when Love itself has decided to meddle in Hijiri's life. Concerned that its favorite charm maker has given up on finding a love of her own, Love delivers a very special gift - the perfect boyfriend, specially crafted just for her. 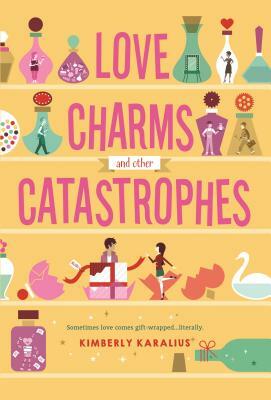 Get ready to be delighted by Love Charms and Other Catastrophes, a unique, romantic sequel to Love Fortunes and Other Disasters by Kimberly Karalius. Kimberly Karalius is the author of Love Fortunes and Other Disasters and its sequel, Love Charms and Other Catastrophes. She holds an MFA in fiction from the University of South Florida and has been sharing stories on Figment.com with a strong following of enthusiastic readers since the site’s inception. Although Kimberly lives in sunny Florida, she prefers to stay indoors and sometimes buys a scarf in the hopes of snow. She loves watching really old cartoons and silent films. Being in Florida certainly has one big perk: going to Disney World. Which she does. Frequently.